Pedro Castle, October 30th 6.30 p.m. This is what the sky will look like at 7.00 on viewing night. I am going to continue with the theme of the Summer Triangle while it is still high in the early evening sky. The alpha star of Aquila, Altair, is a vertex of the Summer Triangle asterism. Aquila (Latin: eagle; sometimes named the Vulture), is one of the 48 constellations listed by Ptolemy, also mentioned by Eudoxus (4th century BC) and Aratus (3rd century BC) and now also part of the list of 88 constellations acknowledged by the IAU. It lies roughly at the celestial equator. NASA's Pioneer 11 mission, which flew by Jupiter and Saturn (in 1974 and 1979 respectively) will pass near one of the stars in the constellation in about four million years. The constellation resembles a wide winged, soaring, short necked, bird, which the ancients identified as an eagle. In classical Greek mythology, it was identified as the eagle which carried the thunderbolts of Zeus and was sent by him to carry the shepherd boy Ganymede who he desired, represented by the neighbouring Aquarius, to Mount Olympus where he became the wine-pourer for all the gods. This explains why the largest moon of Jupiter was called Ganymede, Jupiter being the Roman name of Zeus. The eagle was used to carry or retrieve the lightning bolts that were thrown by Zeus. In the Chinese love story of Qi Xi, Niu Lang (Altair) and his two children (β and γ Aquilae) are separated forever from their wife and mother Zhi Nu (Vega in Lyra, another vertex of the Summer Triangle) who is on the far side of the river, the Milky Way. In Hinduism, the constellation Aquila is identified with the half eagle, half human deity, Garuda. Altair (α Alpha Aquilae) is the brightest star in the constellation Aquila and the twelfth brightest star in the nighttime sky, at visual magnitude 0.77. It is an "A" type or white star located 17 light-years (5.2 pc) away from Earth, one of the closest stars visible to the naked eye. The name "Altaïr" is Arabic for "the bird". The spelling "Atair" is also used frequently. The name was given by Arabic astronomers and adopted by Western astronomers. 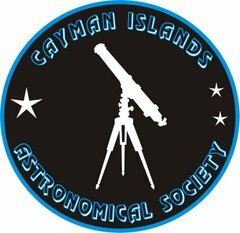 Pedro Castle,Thursday, 2nd October, 7.00 p.m.
As darkness falls on viewing night, the constellation of Cygnus, the Swan, is overhead, in the orientation that is shown above, up being north. Because of the pattern of its main stars, it is sometimes known as the Northern Cross (in contrast to the Southern Cross). One of the most recognizable constellations of the northern summer and autumn, it resembles a swan flying south along the Milky Way. Albireo, a double star with blue and yellow components is at the "head". 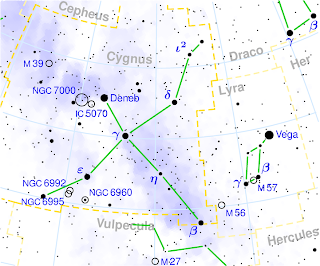 Deneb, its brightest star, is at the tail and is one star of the summer triangle. The Summer Triangle is an astronomical asterism involving an imaginary triangle drawn on the northern hemisphere's celestial sphere, with its defining vertices at Altair, Deneb, and Vega. 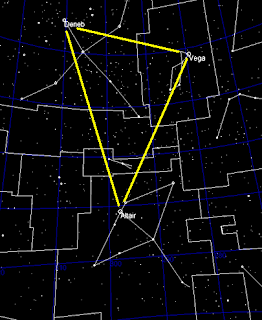 This triangle connects the constellations of Aquila, Cygnus, and Lyra. Looking toward the south, Jupiter, the fourth brightest object in the sky, is in the constellation of Sagittarius. Venus is setting in the west.